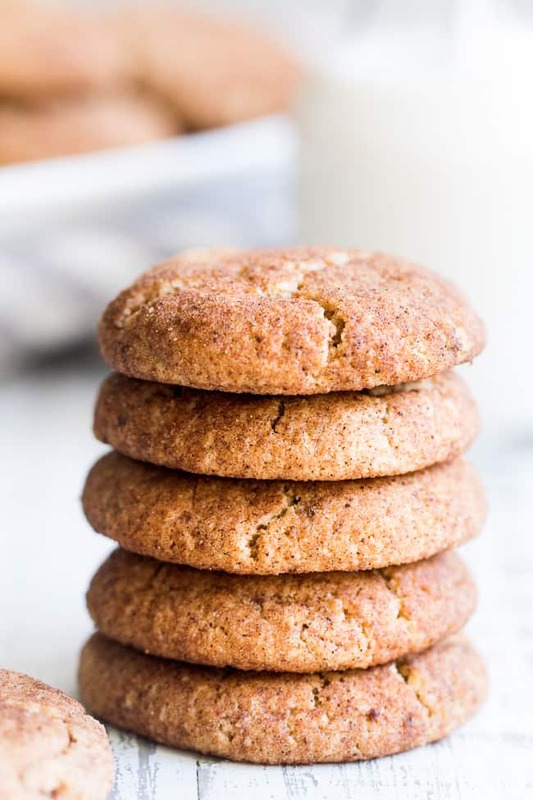 These super chewy, thick and soft paleo and vegan snickerdoodles are deliciously addicting, kid approved, and great for holiday cookie season or anytime a craving hits! Dairy free, egg free, grain free, gluten free, paleo and vegan. It’s day 2 of 3 new paleo and vegan cookie recipes! If you missed my cranberry orange chewy chocolate chip cookies yesterday, you must go check them out ASAP – they might just be my favorite cookies, ever. 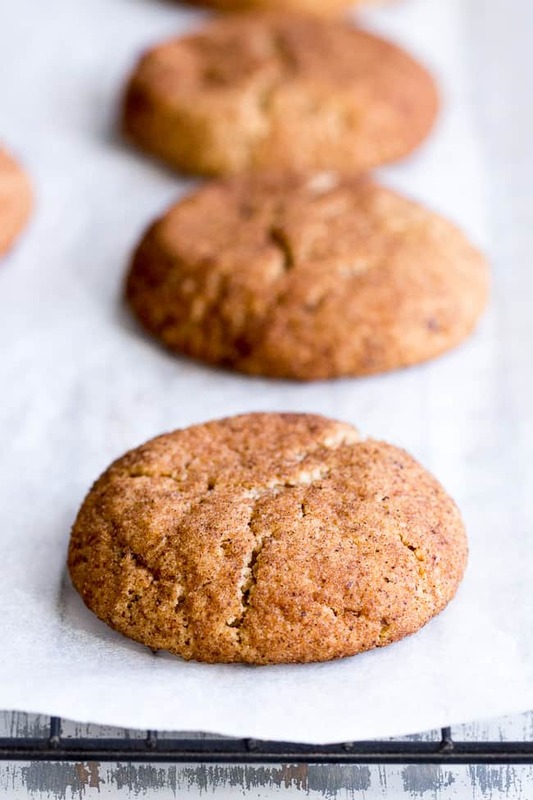 Not to put down these vegan snickerdoodles one bit, because you are in for a major treat with these cookies! It’s so tough to pick favorites when it comes to cookies, so I won’t even try. Let’s move on to the details! 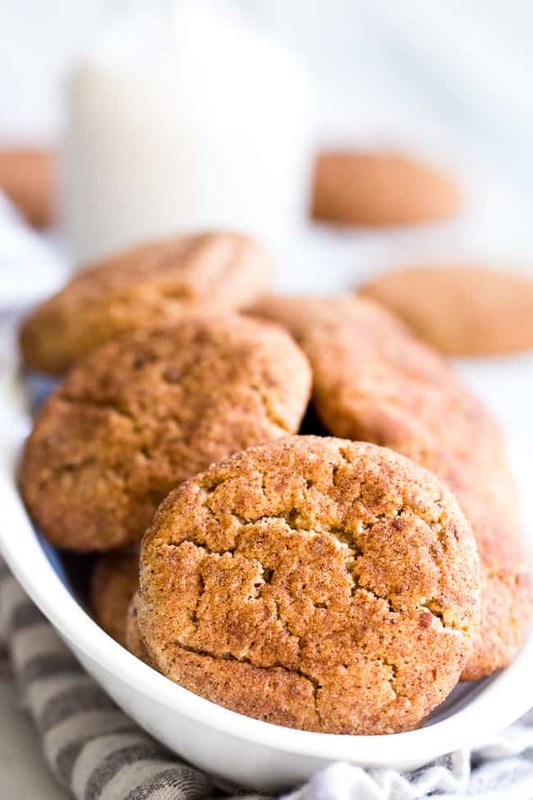 So, here we have snickerdoodles – a simple and delicious cookie with a funky name. 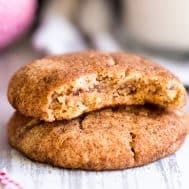 I’ve made pumpkin snickerdoodles in the past and an apple pie snickerdoodle skillet cookie but never good ol’ no-frills snickerdoodles. Now’s the time! 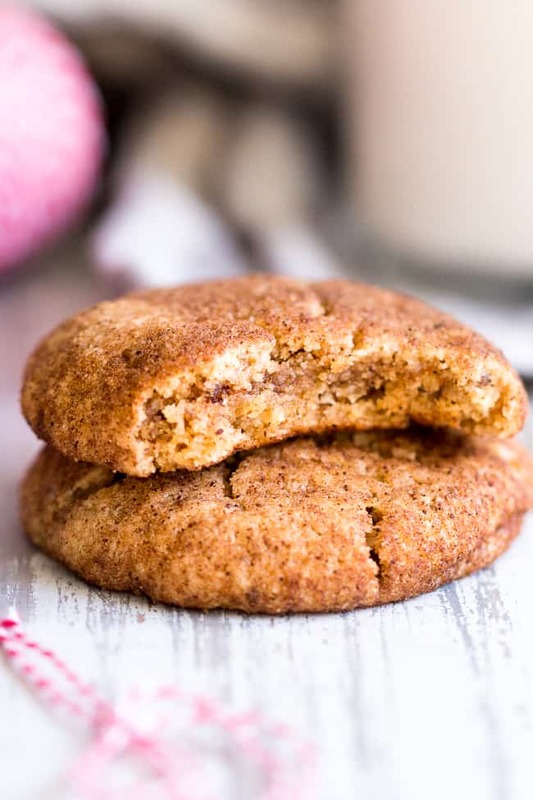 With December here, and me going on a big vegan cookie kick, I figured it was the perfect time to break out THE only healthy, grain free, dairy free, and egg free snickerdoodle recipe you’ll ever need. I used a mixture of almond butter and coconut oil for the fats, maple syrup and maple sugar to sweeten (you can use coconut sugar too, I like maple sugar for how fine and light in color it is), almond flour mixed with coconut flour, and a flax egg to get everything to stick together. Don’t let the flax egg intimidate you one bit – it’s literally just 1 Tbsp ground flaxseed mixed with 2 1/2 Tbsp water, allowed to sit for 10-15 minutes. Easy! 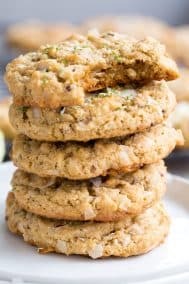 It acts similarly to a whole egg in a cookie recipe, and to be honest, I actually have been preferring the texture of my vegan cookie and bar recipes that use flax eggs to the egg-containing ones. I NEVER would’ve guessed I’d say that, but here we are! Just as with traditional snickerdoodles, you need the dough to be rollable. I found that with my first batch, the dough was easy to roll but the cookies themselves turned out too dry and not pretty, either. I decided to tweak the recipe to get a softer, stickier dough, that could be chilled until ready to roll. It worked! The dough was easy to work with after about 20 minutes of chilling, and the cookies came out perfectly shaped, chewy, and not too dry or too gooey. The best part? I left them out on the countertop for 2 days, loosely covered, and they still tasted pretty much the same on the third day. Low maintenance cookies make me happy! 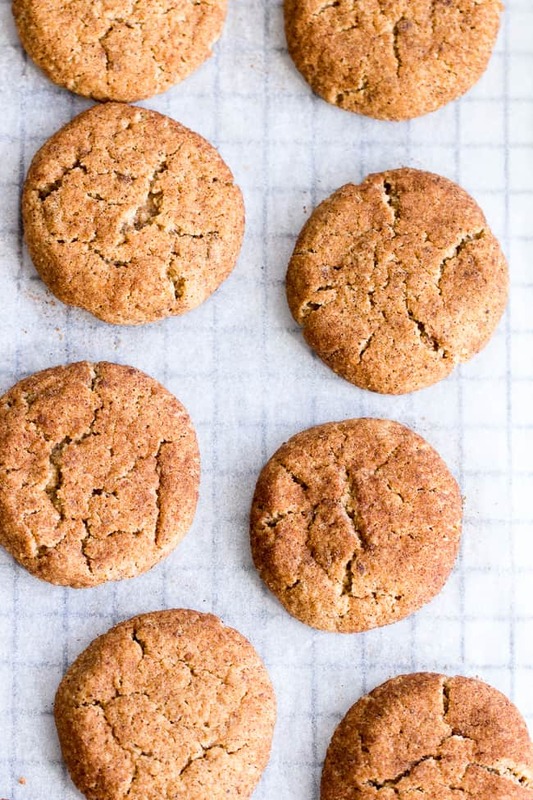 These snickerdoodles also made my family happy too – in fact, my pickiest kid (the 6 year old) requested these cookies after school every day after I made them. He’s typically really sensitive to any baked goods containing “strange” flavors (like almond butter, so “strange”, right?!) and he didn’t notice anything but cinnamon sugar goodness in these! So, just in case you have super picky kiddos like I do, rest assured that these snickerdoodles passed the hardest test. They’re also easy for kids to help out with – and who doesn’t love rolling dough balls in sugar! It’s healthy family holiday (or anytime) baking at its best! Let’s get our flax egg together and the oven preheated! I’m ready to bake cookies – let’s go! Prepare flax egg as described above and set aside. Preheat your oven to 350 degrees and line a large baking sheet with parchment paper. Position your oven rack in the upper portion of oven. Combine the almond flour, coconut flour, baking powder*, salt and 3/4 tsp cinnamon in a medium mixing bowl, stir to evenly distribute ingredients. In a separate larger bowl, use an electric mixer to cream together the coconut oil, almond butter, maple syrup and sugar until smooth. Beat in the flax egg and vanilla and mix on low/medium until well combined. Slowly add the dry ingredients to the wet until fully combined and a dough forms (it will be soft/sticky at first. Chill dough 20-30 minutes (before rolling into balls and dipping in cinnamon sugar). 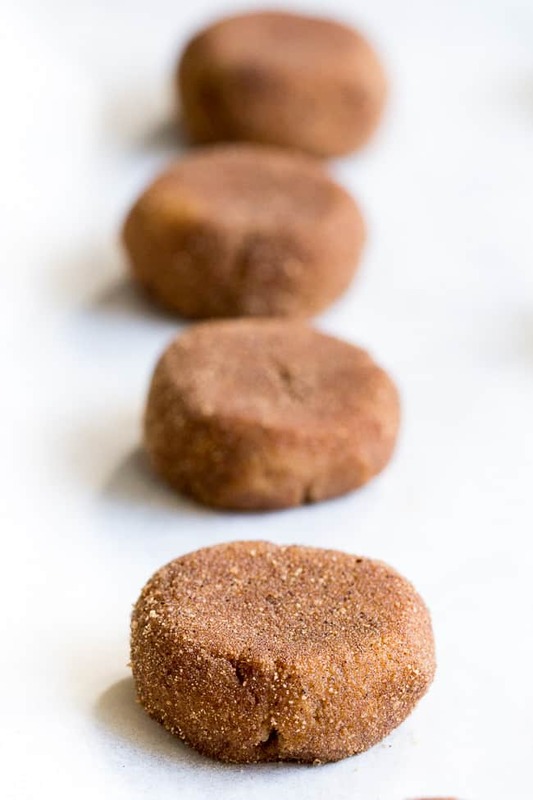 Once dough is chilled and able to be rolled into balls, combine cinnamon & sugar in a small bowl. Form dough 18-20 balls and roll each one gently in the cinnamon sugar topping. Place on cookie sheet 2" apart (bake 2 batches if necessary.) Flatten each ball just a bit (as pictured in post) using your hand or parchment paper. Bake in the preheated oven for 11-13 minutes or until cookies are set and browning. Allow cookies to cool on baking sheet 5-7 minutes (they're very soft at first) before carefully transferring to wire racks to cool completely. Enjoy! Store leftovers loosely covered at room temperature for 1 day, then refrigerate or freeze to keep longer. *Recipe Note: To make paleo friendly baking powder (corn free) mix 1 tsp baking soda with 2 tsp cream of tartar. For this recipe, you will need just 1 tsp total of this mixture. 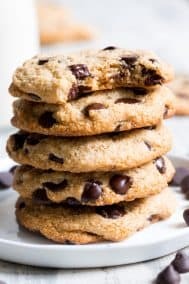 **Coconut sugar will work well in this recipe but will make the cookies appear darker in color. Want More Paleo and Vegan Baking Recipes? Try One of These! I can’t eat seeds, do you substitute one egg for the one flaxseed egg? Thank you! These look delicious! Do you think this dough could be made in advance, then froze? Would you slightly thaw then shape and dip in sugar? I think it can probably be frozen, I would thaw in the fridge and then roll/dip. Hope it works out! I don’t have any flax, I’ve never used it before. We have no allergies or issues with eggs at our house, would a whole egg work in this recipe? Not sure if it makes a difference, but the eggs we have are organic, free-range, and VERY fresh. I’ve tried these twice and they did not turn out at all. Really disappointed. I’m sorry to hear that, what was the issue you had? These were delicious! I used coconut sugar instead of maple sugar because that is what I had on hand. Is butter okay instead of the coconut oil? These look delicious! I’m staying away from added sugar, if I omit the maple syrup and sugar will I need to alter the recipe? Unfortunately I’m not sure how that would work out! These were delicious, as are ALL of your recipes! Thanks formaking going grain-free EASY! So thrilled you enjoyed them! Can you use peanut butter instead of almond butter? No almond butter in the house right now…. thank you! I’m making these cookies this afternoon, can’t wait to see what my guys think of them. Made these for thanksgiving and for my daughter as a healthy snack. They are absolutely delicious, really love this recipe. Really good! Easy to make, my daughter loved them! I kept sneaking one more myself! Made your cutlets also, yesterday, soo good. Have made many of your recipes, and all have been awesome! Thanks so much, for all you do! These look amazing! Do you think a gelatin egg would work? I’m AIP and haven’t reintroduced flax. Thanks! 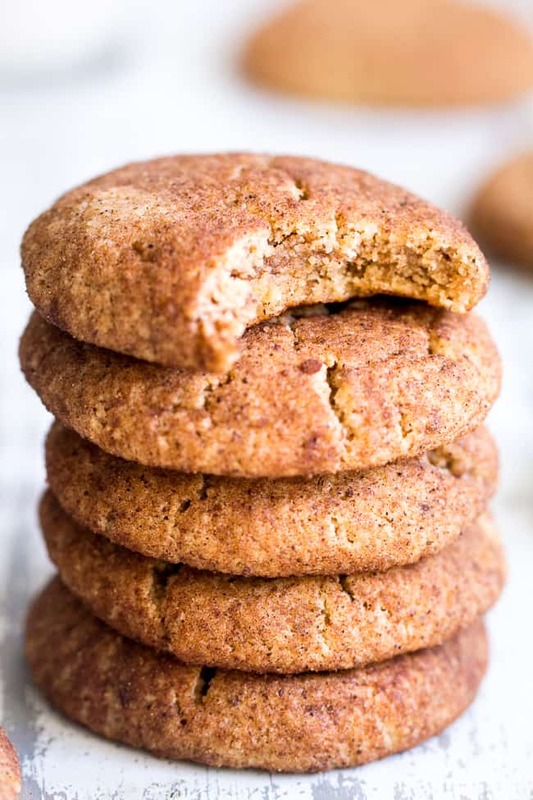 I have made these snickerdoodle cookies for my paleo boyfriend MANY times. They are so soft, chewy, and stay that way for DAYS. 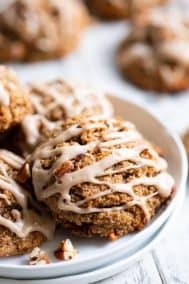 I use Justins Cinnamon Almond Butter in the cookies and add some more cinnamon to the batter. They are OFF THE CHAIN!!! Super yummy! I used 1 egg and honey instead of maple, and they are delicious. I’d like to try with more cinnamon as the flavor in these was delicate (& sometimes I like more cinnamon). I make almost everything you post because, honestly, you haven’t disappointed me yet. I would say that these are by far the best cookies on your site. The texture is perfect; the taste is outstanding. Thanks for all of the delicious recipes!